Torrenting: è sicuro e legale? 92 percent of Americans believe their internet provider should not be allowed to monitor your activity online and sell the data to third parties without their consent, according to a recent study by Comparitech. Comparitech questioned over 1,200 Americans in the period between when a bill allowing that very act was passed by Congress and when it was signed into law by President Donald Trump. The new law, Senate Joint Resolution 34, repeals an Obama-era FCC rule that prevented ISPs from selling off customers’ browsing data to advertisers and other third parties without consent. Despite the overwhelming unpopularity of such a practice, more than half of respondents said they weren’t even aware of the bill. The vote in Congress was largely split along party lines, receiving no support from Democrats, while only a handful of Republicans voted against the bill. Almost four out of five Americans said that if their Representative or Senator voted in favor of the bill, it would dissuade them from voting for them in the future. The study was spread roughly equally between age groups, genders, and regions across the US. While ISPs seem to think it’s acceptable to sacrifice privacy for profits, their customers don’t agree. 75 percent of Americans said they wouldn’t allow their internet provider to monitor their online activity and sell the data collected to other companies in return for a half price bill. 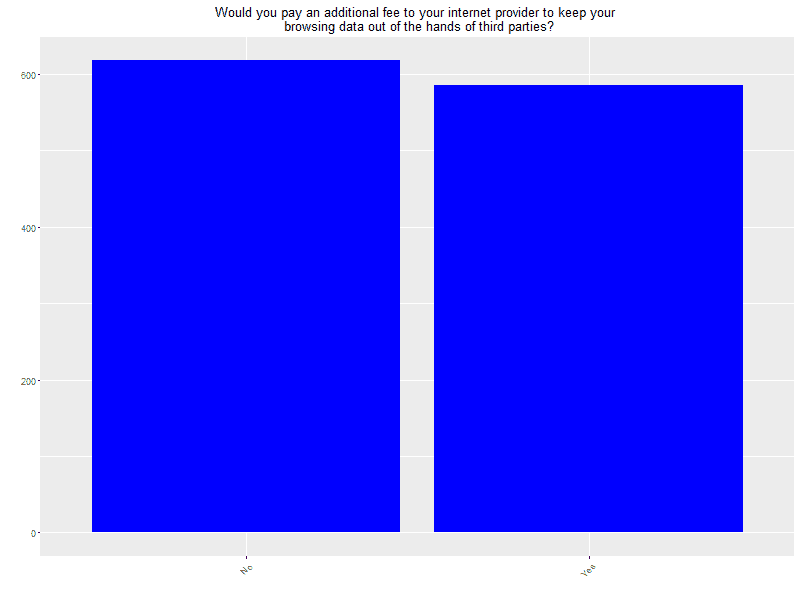 In fact, almost half said they would pay extra for their ISP to keep their browsing data private (statistical note: p-value > .05). 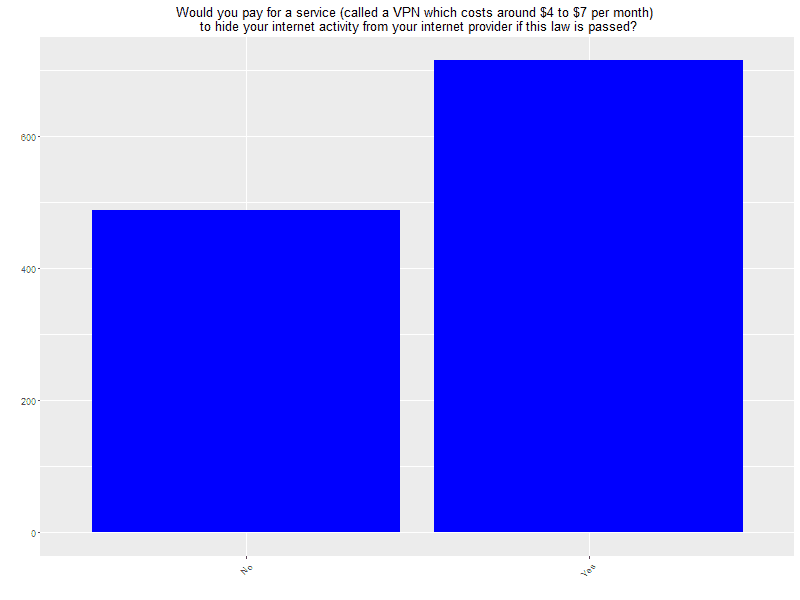 And almost three out of five respondents said they would pay for a VPN subscription to maintain their privacy. A VPN is a service that encrypts a device’s internet traffic and routes it through an intermediary server in a remote location. 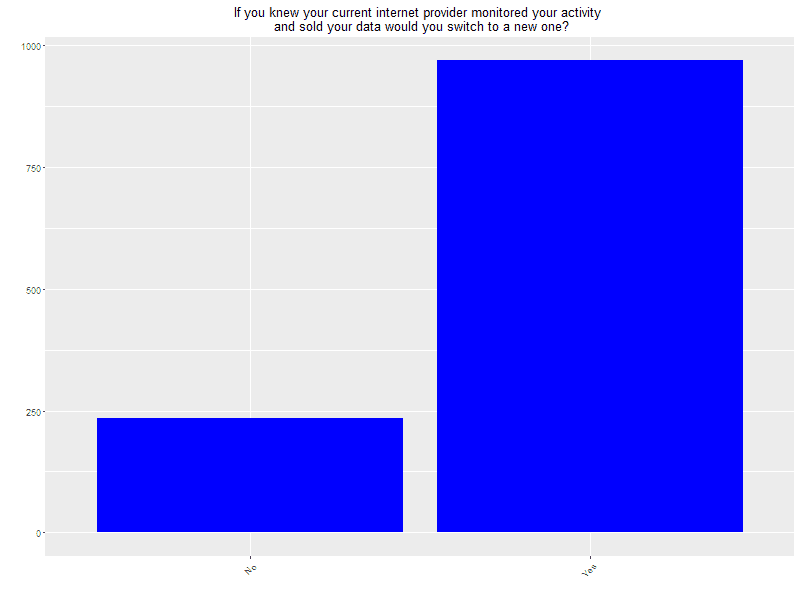 Among other privacy benefits, it prevents ISPs from seeing and recording what a customer does online. Talk is cheap, and we realize that not everyone will actually follow through on a survey answer. But the results of this study do reflect the 239 percent increase in referrals from Comparitech’s own website that resulted in VPN sales just within 24 hours after the bill was passed in Congress. Nearly 60 percent of respondents, both men and women, said they would change their browsing habits under the new law. More than 80 percent of Americans said they would switch to a new ISP if their current one started selling their browsing data to third parties. Unfortunately, many Americans would not be able to make a switch even if they wanted to. ISPs often hold regional monopolies or duopolies while also making it extremely difficult for new, smaller competitors to enter the market. 70 percent of respondents said they don’t think they have sufficient choice among internet providers where they live. Is there an age gap? Why are legislators so disconnected from their constituents on this issue? Well, there’s a big argument to be made about money in politics. 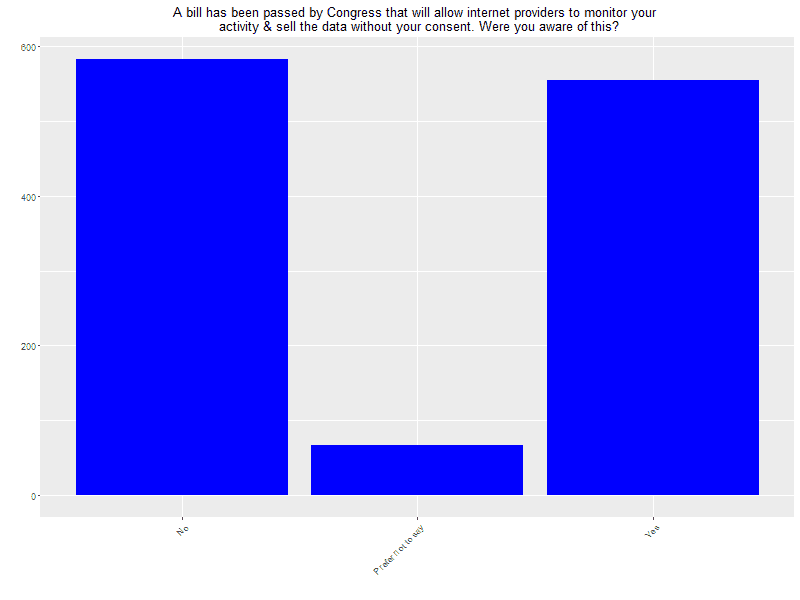 The Verge published an article showing how much money ISPs contribute to the Senators and Representatives that passed this bill. We expected people to be less concerned with internet privacy as they got older. Seniors are less tech savvy and thus don’t care or don’t understand, right? Wrong. In fact, the 18-24 age group turned out to be the least opposed to their browsing data being sold to third parties. Again, 18-24-year-olds drop the ball. 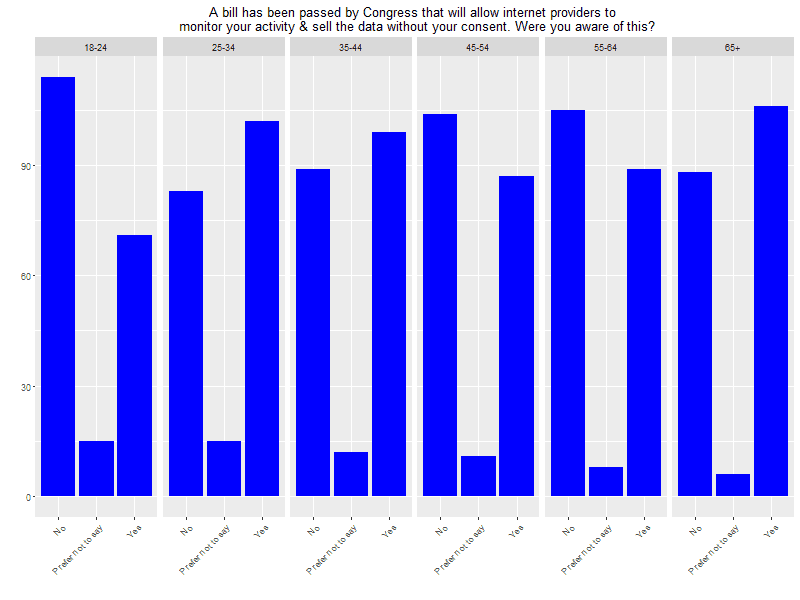 Every other age group, even senior citizens, were far more aware of the bill than those of college age. 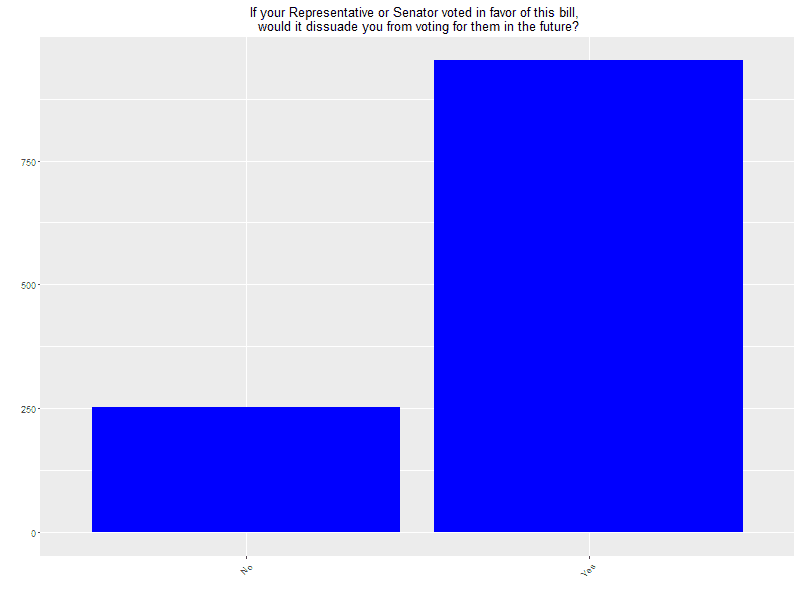 Age was not a significant factor when respondents were asked if they would be dissuaded from voting for legislators who supported the bill, however. In case you were wondering, the average age of Congressional Republicans is 55 in the House of Representatives and 61 in the Senate. Democrats are older at 60 and 63, respectively. You can’t blame elderly people for ignorance or apathy on this issue, for one thing. Second, Republicans might want to reconsider taking payoffs from ISPs if they want to get re-elected (although Congressional re-election rates are absurdly high thanks to gerrymandering, but that’s an argument for another day). Lastly, privacy advocates need to focus more on the young generation to raise awareness and support for internet privacy. The simplest, most effective method of protecting your privacy from your ISP and other entities is to use a VPN when connected to the internet. A VPN encrypts all of your internet traffic and routes it through a remote intermediary server in a location of your choosing. While connected to the VPN, your ISP can only see that data is going to a VPN server, but now what website or the contents of your web traffic. Another option is to use Tor, which is free but much slower and blocked by some websites. You can learn more about both methods in our guide to stopping ISP snooping. To help you choose a private and secure VPN–not all of them are–read our assessment of over 20 VPN providers’ privacy and security practices.